The summer is beating down on Japan like Dr. Wily just unleashed a wave of Heat Man robots to terrorize the city! We don’t have Mega Man to save us, but we do have our own robot specialist: Yamatron! Yamatron, like his nickname implies, is a machine when it comes to producing artwork. 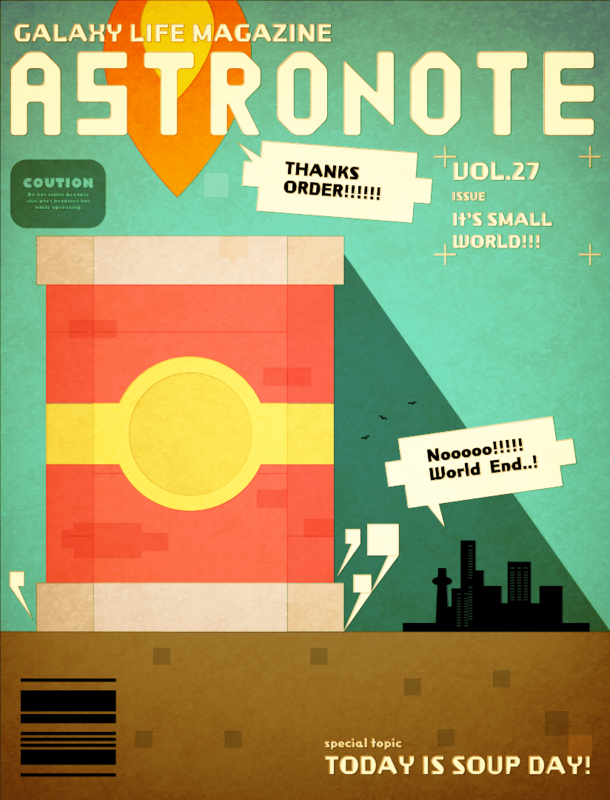 We came across this new ASTRONOTE cover today, though no one knows when he actually put this together. We’re planning on releasing an update this week, plus we have some exciting things to talk about in August. Stay tuned! Nom Nom Galaxy T-Shirt contest! As promised, we’re back this week with another grab bag of PixelJunk to give away! Last week we released wild Nom Nom Galaxy Early Access keys on to the Twitter-verse, but this week we’re going with something a little more tangible. We’re taking Nom Nom Galaxy to PAX Prime next month and we’re celebrating with some new gear. Yamatron made some awesome designs, but there can be only one! We’re asking for a little help picking the final design from our fellow Astroworkers. Of course, we wouldn’t leave you guys out in the cold without a shirt on your back, so we’ve got three fabulous ways for you to get your own. Head over to Facebook where you can vote for your favorite everyday. We’ll choose five Astroworkers at random to get one of these rare Nom Nom shirts. The second way you can put your name into the soup pot is to follow us @PixelJunkNews on Twitter and watch out for tweets telling you to RT the contest URL. 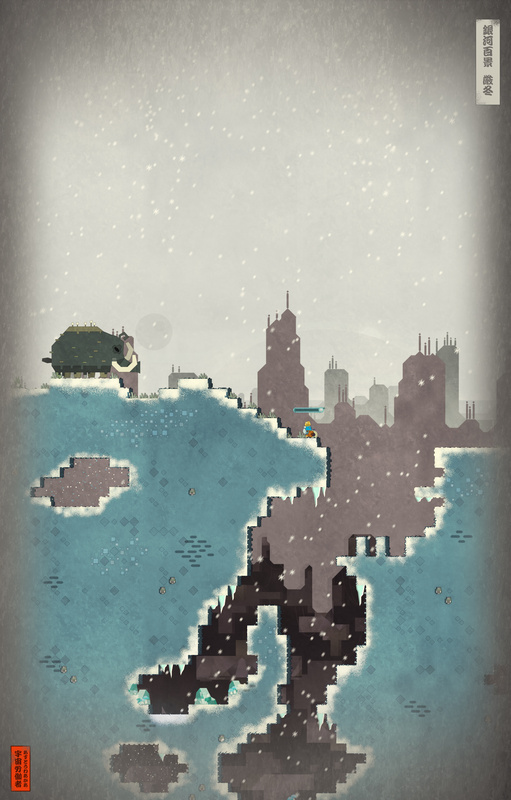 We’ll pick five more Astroworkers from those RTs to get the latest in PixelJunk fashion. Finally, we’ll bring a bunch of t-shirts to PAX Prime next month for some lucky Astroworkers who can demonstrate their soup shipping prowess! This contest will run until 11:59pm PST on August 3rd! ‘Cause we all love free stuff! Welcome back for another week of shenanigans and tomfoolery! 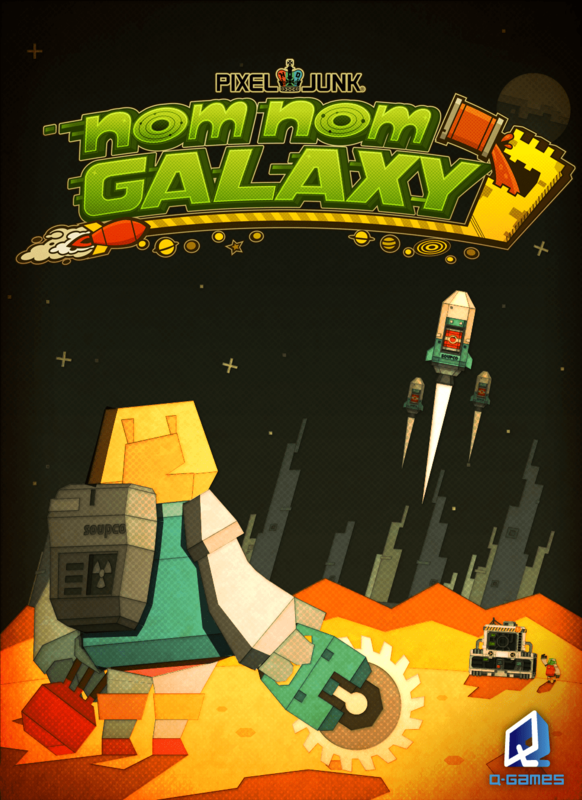 This week we’d like to introduce you to some box art we’ve been working on for Nom Nom Galaxy. Yamatron’s blessed us with something special here. The Astroworker, the foundation of the Soup Co. empire, takes center stage here. He’s looking off into the distance as one of our soup laden rockets takes delicious goods to neighboring planets! Why are we working on box art? Ummm… never mind that! We’ve got free stuff to give away! 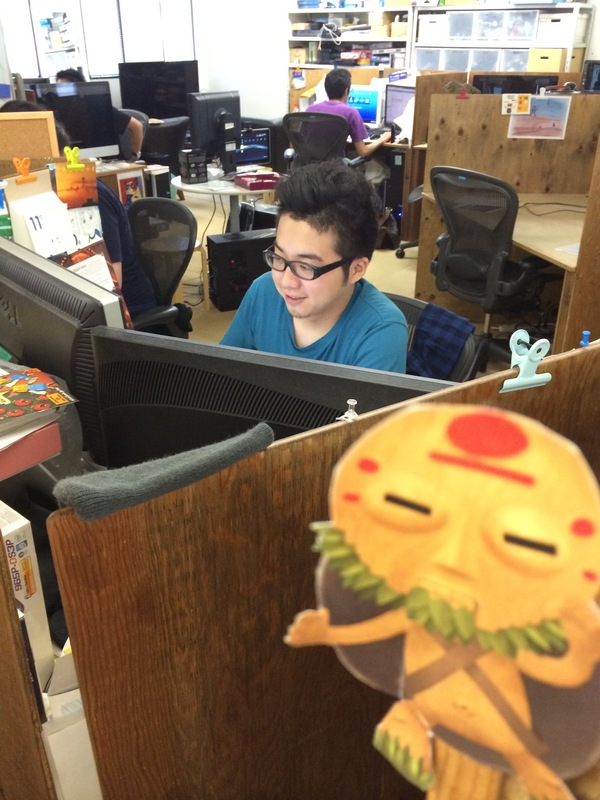 Starting this week, you can win FREE PixelJunk swag by following us on Twitter @PixelJunkNews or @PixelJunkJP (If you speak da Japanese). Every Friday we’ll tweet something yummy for you to RT to all your friends and enemies. We’ll give five lucky RTers something from the PixelJunk grab bag, like codes for PixelJunk games, t-shirts, and other goodies. This week you can get your hands on a Steam key for Nom Nom Galaxy! As always, please let us know what you think in the comments here, on our Steam Community, Facebook, or Twitter! See you next week! Astroworkers! This week the biggest typhoon in ages was supposed to hit Japan, but after some rain last night the only thing assaulting us is HEAT! 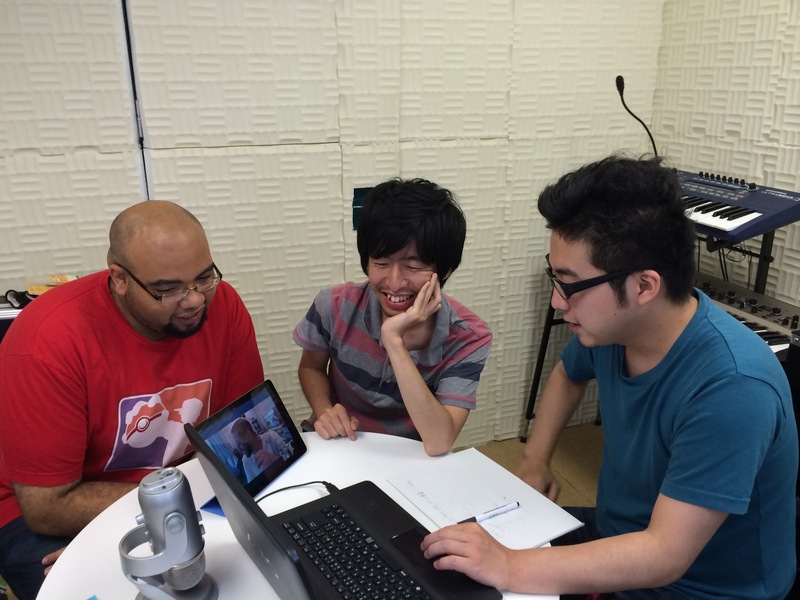 As we talked about in last week’s post, the team’s hard at work on expanding Nom Nom Galaxy for our next big update. 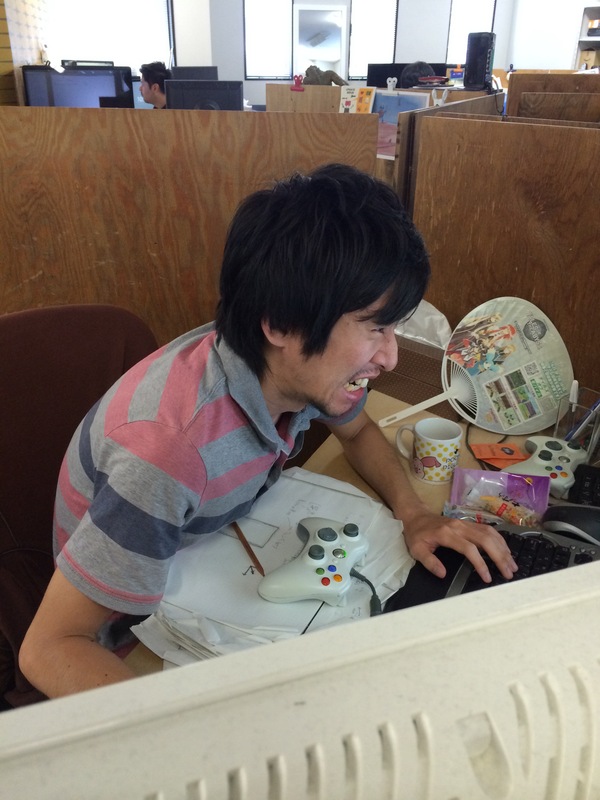 Let’s check in on our programmer, Sawa! Looks like he’s having some problems… Perhaps our artist, Yamatron, is faring better! Let’s peek in on a team meeting! Ah, that! Yeah, there have been some heated conversations within the team about feedback. There’s a new soup era coming and everyday is filled with us going back and forth over gameplay particulars. We should have some cool stuff for everyone in the next update. Expect us to bring even more delicious flavors to the table! It’s that time of the week again, Astroworkers! And for this week’s update we’ve got some great news this week about the upcoming development this month! Since Nom Nom Galaxy launched in March, we’ve been taking feedback, fixing bugs, and slowly adding features, all in the hopes of making the soup empire experience as tasty as possible. The weekly updates have served the team really well in this regard. It’s enabled us to react quickly to issues that spring up. Moreover, thanks to all the feedback from players on Steam, Facebook, and Twitter, we think that Nom Nom Galaxy is more accessible and fun than it was when we launched just a few short months ago. Now that July is here, we’re ready to throw on all the burners and prepare some more substantial courses! And seeing as how it’s July 4th, this might be the time to start thinking about turning those burners on some nice, juicy mammoth meat…! This month we’ll be holding any updates on Nom Nom Galaxy for a much larger update at the end of the month. This allows us to work on some larger features that we haven’t been able to focus on with our week-to-week update schedule. We’ll still be posting to the blog, so you can monitor what we’re up to here and in the Steam community forums. To whet your appetite, here’s a hint at what we’ve got in store!